I have a really slow internet connection in the university i am studying in so for installing applications i have to usually keep my laptop powered on for considerable period of time this almost makes it impossible for me to remove my existing Ubuntu installation and do fresh new installation again as i risk losing all my downloaded packages. APTonCD is a tool that can help you precisely in such situations . 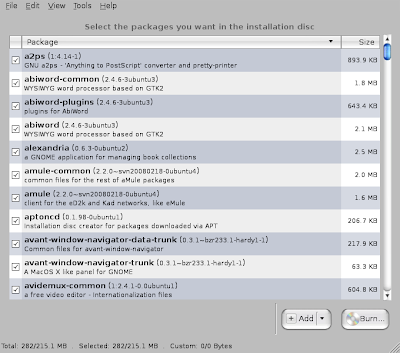 Whenever you install applications via synaptic/apt-get/aptitude the corresponding Debian files are downloaded and stored ( /var/cache/apt/archives) then they are installed on your system . APTonCD helps you create local repositories of these downloaded package files along with all its dependencies on a CD/DVD so that you could install these application on any computer whether internet connection is available or not using apt-get tool. After above step is completed you could launch APTonCD from (System->Administration->APTonCD ) . Now to create ISO of packages presently availble on your system press "Create" button or to "Restore" from already created ISO/CD/DVD press "Restore" button . When you click on "Create" button it shows all the packages available which could be used to create the local repository ISO . You can remove packages from the list or add more from alternate locations in this list. After you have finalized packages with which you want to create local repository ISO clicking on the "Burn" button takes you to window where you finally chose what kind of media you would like to burn these files onto CD/DVD and location where to store this ISO created. Once CD/DVD/ISO is created packages from it can be easily installed by clicking on the "Restore" button of the APTonCD . "Restore" basically copies files from CD/DVD back to APT cache so that when you install any package using apt-get/aptitude they can be installed quickly without having to download those packages from the internet. Overall APTonCD is an extremely useful application that could help you reinstall ubuntu easily without having to worry much about downloading all the packages again . YESSS!!! This is what I have been looking for ,fruitlessly, for months! Maybe even years! I have a standalone desktop computer at my home, where I have NO network access. It is impossible for me to get updates or universe/multiverse programs (MP3 support, mostly) onto it. I hope this works!! Thank you! !